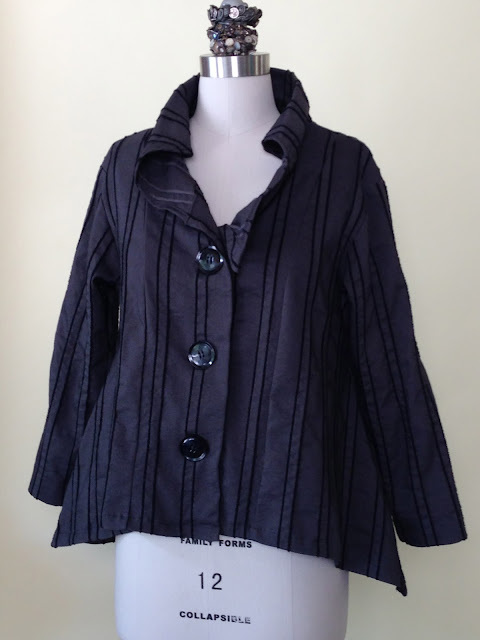 If you read my last post about the shirt I made from Lynn Mizono's V1274 pattern you will remember that I promised to send along photos of Helen Papke's jacket interpretation. Two sewing pals sent me photos they had so you can see why I love it so much. 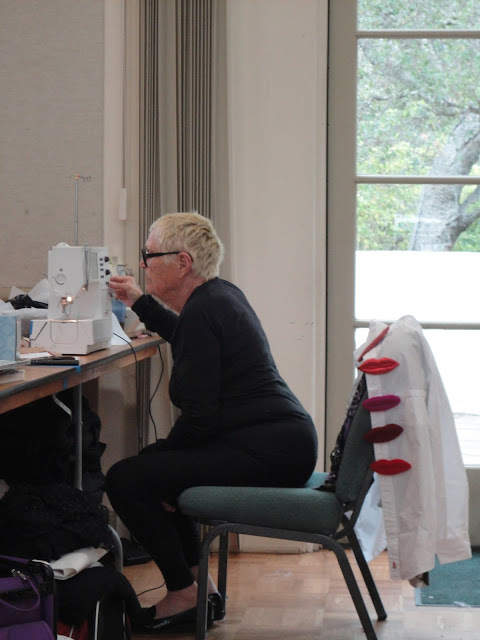 Huge thanks to Sharon Coker, a longtime DOL attendee and travel-mate for the close up shots and to Steph Rich who has a very cool design/sewing blog. Check it out here. I've never met Steph in person but I've known her through her posts. 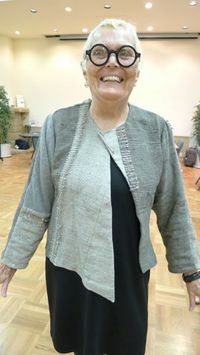 Above are two photos of Helen at DOL Santa Barbara 2012 modeling for Marcy Tilton who had them on her blog following the retreat. Close ups provided by Sharon. I'm so happy to have these. 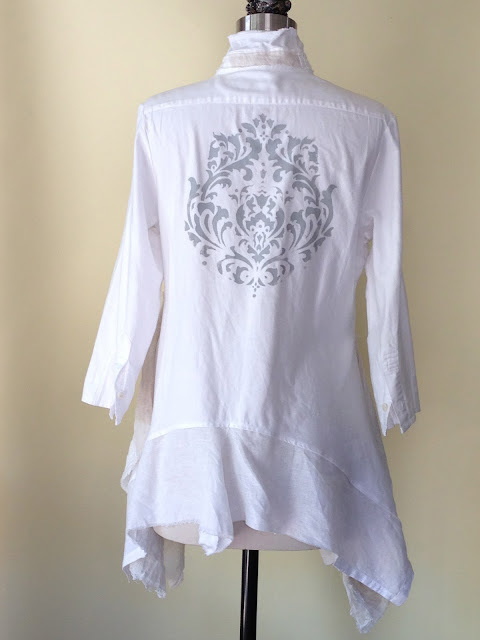 In the photo above you can see one of the back options of connecting the two side "tails"
Now you see why I (and many others) channel Helen when we sit down to design something. She's fearless and hugely talented. I've had this Lynn Mizono's pattern in my to-do pile for over two years. It kept working it's way down the pile. I cut it out over a year ago but never found the right fabric. 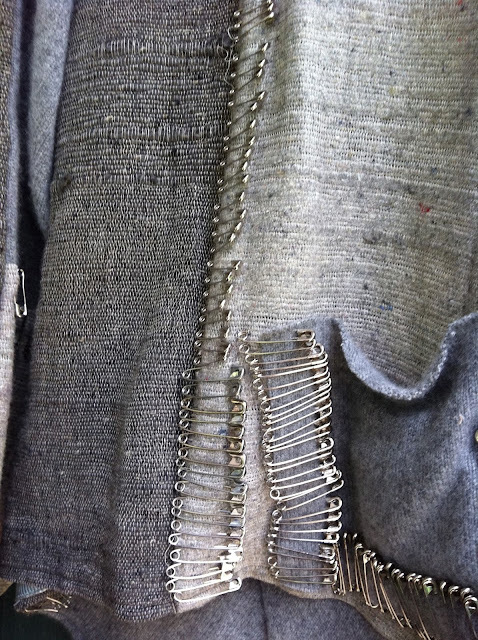 I first saw Helen Papke make it in various gray fabrics; silk, cashmere, safety pins(!) as a jacket. I'm sorry to say I can't find the photo but if I do I'll post it. Magical garment! Here's a photo of the unsinkable Helen at one DOL. She made the shirt draped over her chair. The buttons are felted lips. I've considered several ways to make it but, as per my usual method, I chose a fabric for the first go 'round that I wouldn't mind messing up. I can't remember where I bought it, I'm sure it was online because I remember when it arrived I said to myself, "Well THIS isn't what I thought it was going to be!" But it's turned out to be a really nice fabric and easy to work with. It's a lightweight synthetic black and white stripe with a semi-permanent wrinkle. When I say semi I mean when you wash it the wrinkles stay; when you iron it the thing goes flat. A problem if you don't know in advance. But, it worked well for the facing pieces, made them lay flat, I liked that. 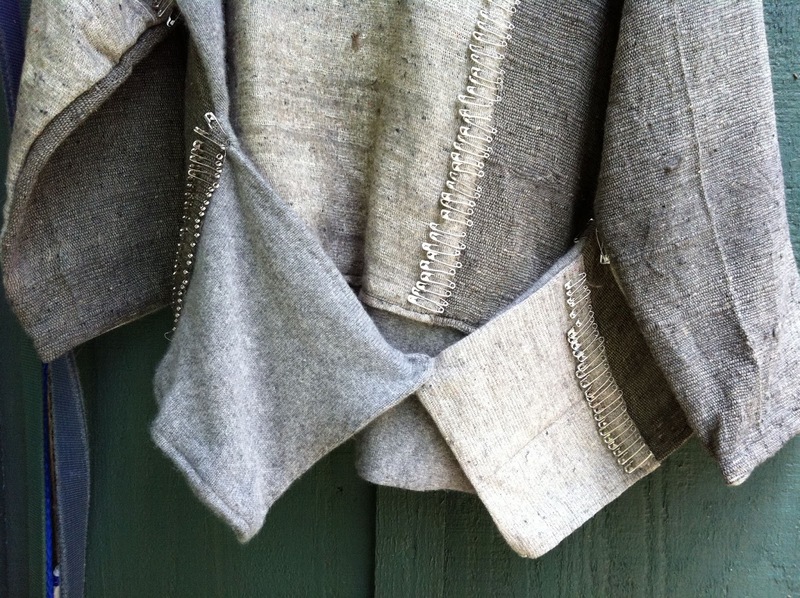 I made the longer version, using the selvage for the collar and vintage 30's buttons. I narrowed the sleeved. I don't like bell shaped sleeves, they get in my way. I love this pattern. It's well written and worked the first time. You know that doesn't happen often! I'm going to make this in several types of fabric. 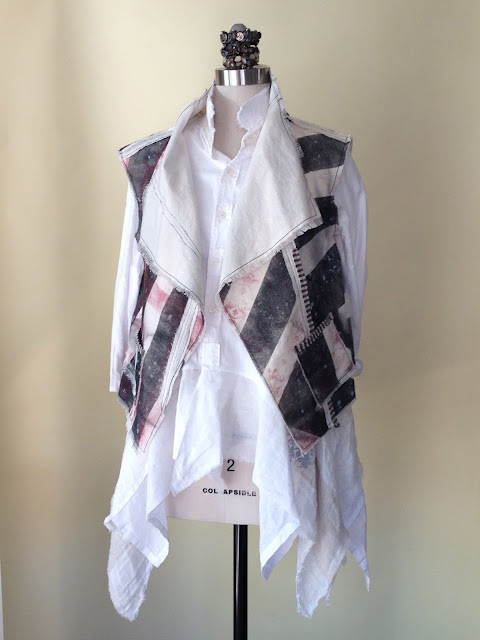 I have an old kimono that I'm thinking of taking apart and remaking with this pattern.The longer version is supposed to be made with shirting fabrics but I think, with the addition of pockets, it will make a great leight weight jacket to go over my long and drapy tops. Helen made the shorter version for her jacket. 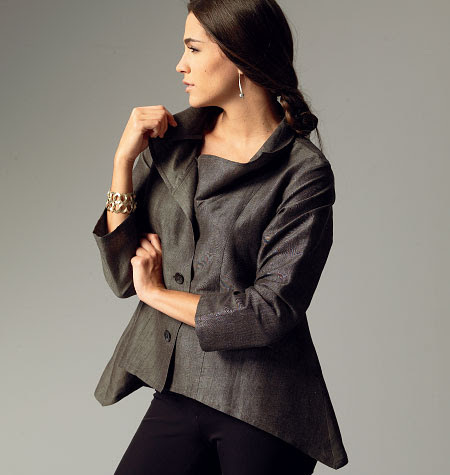 It was fairly structured because of the weight of the fabrics which was very pleasing. 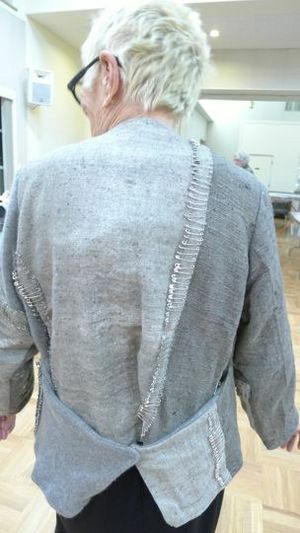 She embellished it with several hundred safety pins, big wow! Dang I wish I could find that photo! Here's the link to the pattern. http://voguepatterns.mccall.com/v1274-products-15137.php?page_id=716. Give it a try. This post is about two garments. I'm combining them because I wear them together and think they both look better as an outfit. This makes for a long post which I promised not to do when I started this. Hmm.. I'll have to work on that. I'll talk about the shirt first. I still have a bad crush on thrift store men's shirts. Just when I say I'm never going to work with another one I get the urge. They are made so well that they are a hairball to take apart! So, I've been thinking of ways that don't entail ripping out seams. This shirt doesn't fall into that category because I made it before I swore off that method. It was made with a traditional shirt that had a front placket typical of many men's shirts. I didn't want that look so instead of cutting off the whole placket I cut into it in parts to create little patches in several spots. Then I overstitched with perle cotton. I added old buttons that were from my grandmother...she collected buttons. More on that family saga in another post. I sliced one layer of the collar off to create a raw edge, love those guys. I then cut the hem so that it is shorter in the front and back, longer on the sides. 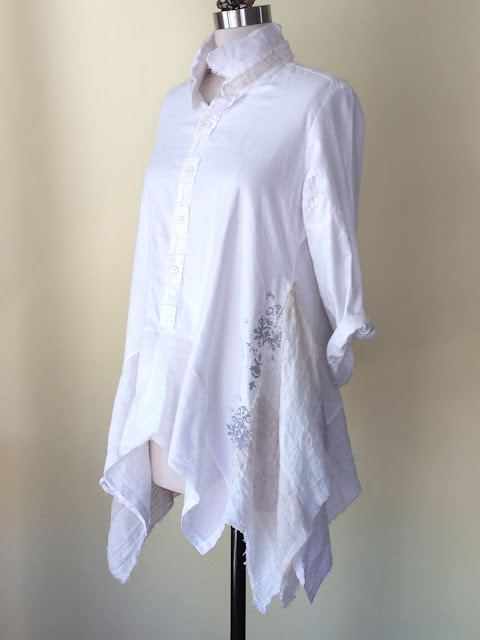 I added a wonderful subtle striped linen for a flounce in the front and a beautiful lightweight linen from a thrift find in the back. I cut off the cuffs and hemmed the sleeves. 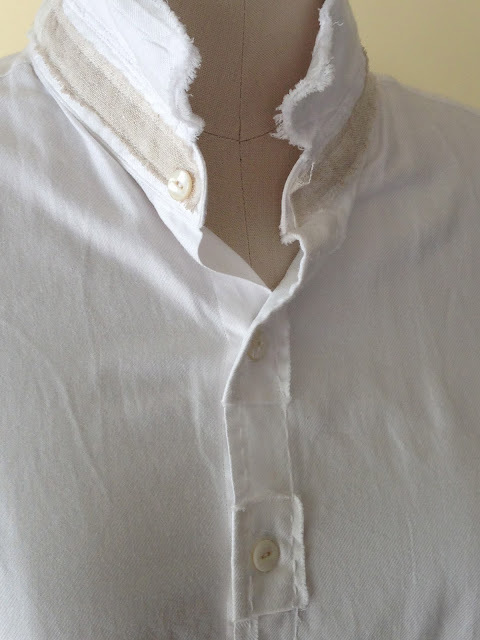 The collar has a bit of the stripped linen applied to tie it together. Then I stenciled it with The Crafter's Workshop Brocade pattern. I used Jacquard fabric paints blending a metallic grey with white to make it more subtle. It's a fun look although a bit flouncy for me, hence the pairing with the more bold vest with black stripes. OK, the vest. I seem to have the fabric painting bug and can't shake it. Never mind, it's fun and I'm branching out. 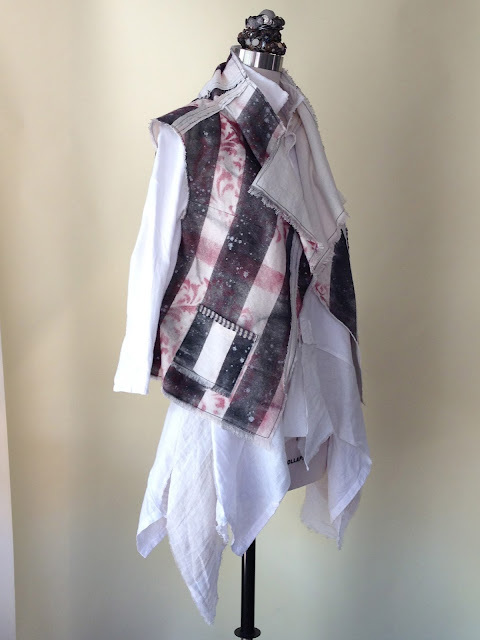 Here I used a lightweight canvas, sort of duck or really heavy muslin from Beverly's. I masked it off with painter's tape and spray painted it with Liquitex Professional Spray Paint. I love this stuff. It has a bit of a hard hand but in this particular application it's fine. Then I spray painted the same stencil with red. 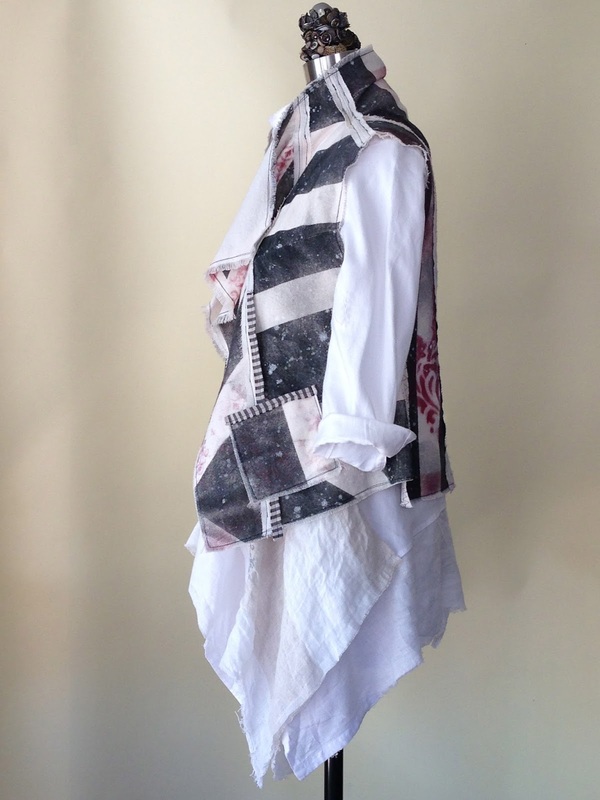 I've been wanting to try Katherine Tilton's idea of making a vest out of Marcy Tilton's jacket pattern V8430, leaving off the sleeves. 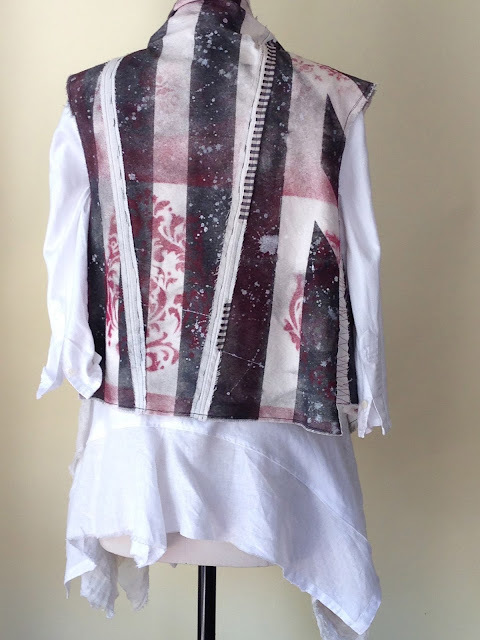 She had a terrific article in the August/September 2009 issue of Threads Magazine about making vests with exposed seams. I added some top stitching to the exposed seams and a few pieces of striped fabric. Then smacked a couple of pockets on...gotta have pockets. Oh and in the end I splattered it with watery white fabric paint to make the whole thing feel like it comes together. Don't ask me why I think it works but I do. 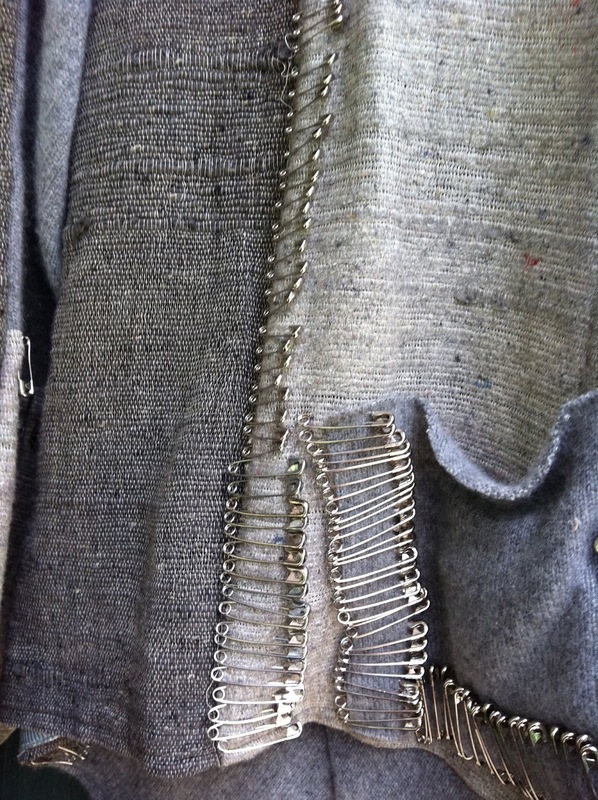 I LOVE the process of not planning a garment, just winging it and see what happens. It's such a contrast to the pattern-following thing. I love them both really. As you'll see in my next post where I made a Lynn Mizono shirt...by the book! You can see that I'm not too neat with the spray paint. I like it that way. Oh, and after I got the shirt done I found a stain on it! Hate when that happens and it's a chance you take with thrift store finds, they seem to show up even after washing. 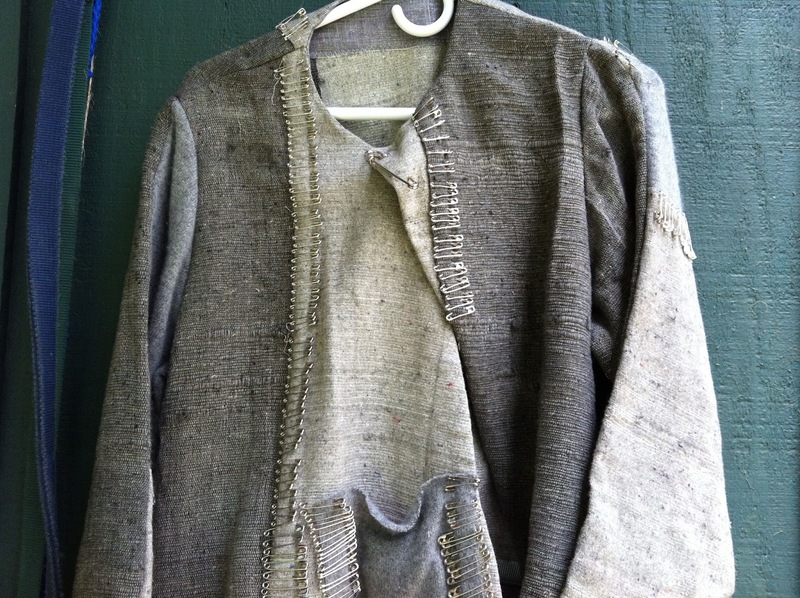 So, I did an Alabama Chanin thing that you can see just a bit on the left sleeve above. 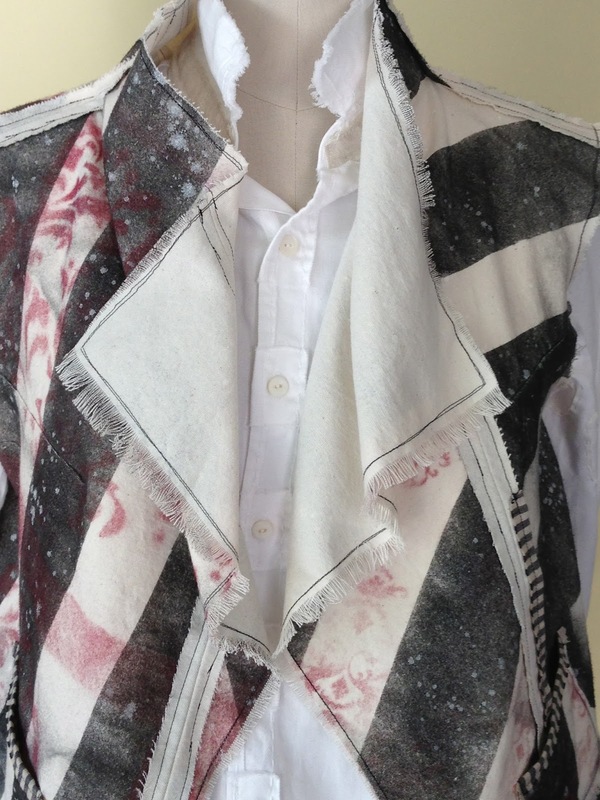 I've made the vest from this pattern (see this blog under vests-it's the green one). This time I wanted to try the jacket since Marcy had one at DOL Sisters that I loved. As with most patterns, I like to try it first in a fabric I've picked up for a song. This one is a very stretchy woven I got at the Sewing Expo in Puyallup a couple years ago. I love the way it turned out. It's a bit roomy so I immediately cut it down to a size 10 for next time. I'm going to wear this jacket a lot. 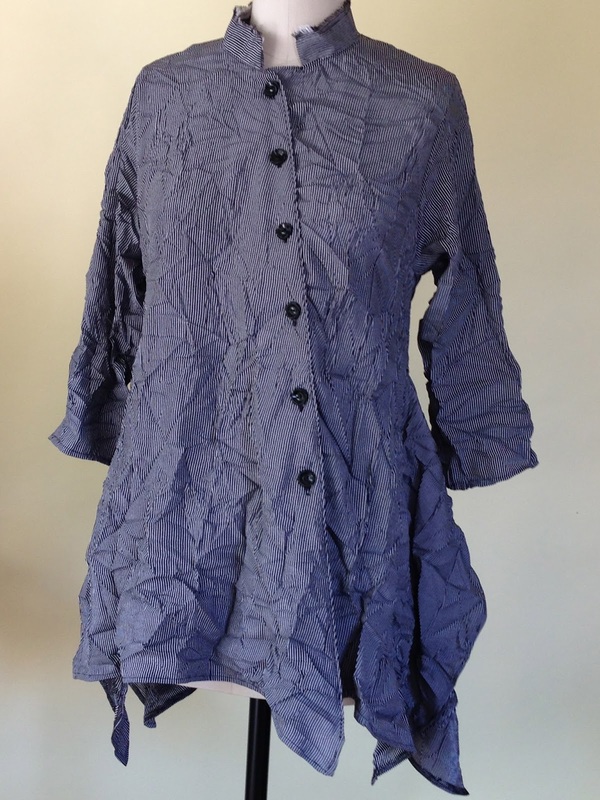 It has everything I like; drapy lines at the side hem, roomy but flattering lines (love the collar and neckline) and two pockets. I could also see it lengthened for a swing coat. And, best of all, it's really easy. It's a keeper.